When it comes to looking for life on other planets, scientists tend to focus their search on planets that have the right conditions for liquid water to form, but Saturn's moon Titan might just point the way to the existence of life without water. 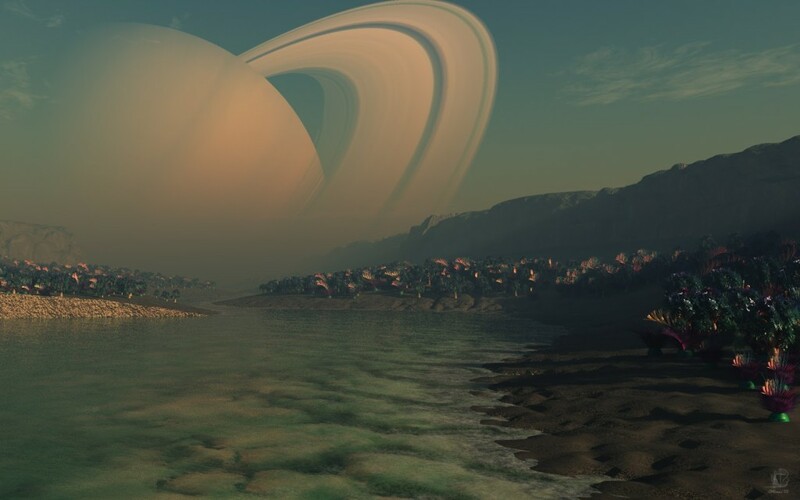 Researchers in the US have been analysing the chemical composition of Saturn's largest satellite, and think the presence of hydrogen cyanide (HCN) molecules in the atmosphere could pave the way for different forms of life to evolve. That's because HCN reacts to form polymers including polyimine, and polyimine is able to absorb a wide spectrum of light – so wide that it's enough to capture light penetrating Titan's dense and hazy atmosphere. With that light, the scientists think polyimine could be a possible catalyst for life. "Polyimine can exist as different structures, and they may be able to accomplish remarkable things at low temperatures, especially under Titan’s conditions," said chemist Martin Rahm from Cornell University. "We are used to our own conditions here on Earth," he adds. "Our scientific experience is at room temperature and ambient conditions. Titan is a completely different beast." Titan is Earth-like in that its surface is covered with lakes, rivers, and seas, but these are made up of liquid methane and ethane rather than water. The nitrogen and methane in the air make the planet's surface too toxic for humans to survive, but the researchers suggest other types of life could prosper. The study builds on the Cassini-Huygens missions that have been ongoing for nearly 20 years. The data collected by the Cassini orbiter and Huygens probe – which landed on Titan back in 2005 – have been invaluable in allowing the Cornell team to simulate a prebiotic chemical trail that could lead to life... but not quite life as we know it. The data from the NASA probes was plugged into a computer simulation run by Rahm and his team, which revealed that polyimine could spark life in the ultra-cold temperatures on the surface of Titan. Polyimine's precursor, hydrogen cyanide, has previously been linked to the start of life on Earth. "If future observations could show there is prebiotic chemistry in a place like Titan, it would be a major breakthrough," said Rahm. "This paper is indicating that prerequisites for processes leading to a different kind of life could exist on Titan, but this [is] only the first step." The research could mean Titan offers two chances of hosting alien life. Scientists think that there is liquid water under the frozen surface of Titan, but locked away in a massive underground ocean – and there's a lot of speculation that these kinds of underground oceans located throughout the Solar System could hypothetically give rise to life. In any case, if the researchers turn out to be right about the polyimine, we can broaden our search for extraterrestrial life beyond planets that very closely match Earth's environments – and that could be pretty huge. The findings have been published in Proceedings of the National Academy of Sciences.